Premiering tonight at the University's Seymour Theatre Centre is award-winning playwright Neil Cole's Topo the Play about legendary champion Rugby Union player, Enrique 'Topo' Rodriguez and his struggle with bipolar disorder, or manic depression. 'Topo' himself will be speaking at the premiere, along with the University's Professor of Psychiatry Ian Hickie, Executive Director of theBrain and Mind ResearchInstitute(BMRI) which is sponsoring the play. 'Topo' Rodriguez amassed an unequalled Triple International Rugby Union career of 42 test-matches (Argentina, Australia and Tahiti) before retiring in 1987. It was then that he faced the biggest challenge he had within his own life - mental illness. 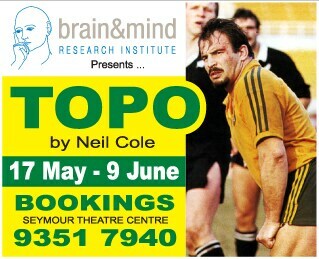 Topo the Play focuses on events surrounding the 1984 Grand Slam tour of the UK and Topo's relationships with his coach Alan Jones and indigenous player Mark Ella who, unlike Topo, was happy to retire at the end of the tour. Humorous and engaging, it reveals keen insight into the effects of melancholia and depression on an otherwise high-achieving and healthy person's life. Topo is the ninth full-length play by award-winning Victorian playwright, Neil Cole, former member for Melbourne (Victorian Parliament) and himself a bipolar sufferer. As associate professor at Monash University, Cole works with the BMRI on issues related to the arts and mental illness, "particularly concerned with writing and creative work with people with mental illness," Professor Hickie said. The BMRI investigates the neurobiological basis of psychological illness and is also concerned with increasing public understanding of these issues. In sponsoring Topo the Play it continues its tradition of supporting community events which increase community understanding of people with mental illnesses and their experiences. "We're very proud to be associated with the play and supporting its production here," Professor Hickie said. Financial proceeds from the play will be redirected to the BMRI and the Black Dog Institute to contribute towards the fight against bipolar disorder and depression as well as towards youth suicide prevention. The play features Peter Hosking as Topo Rodriguez, Isaak Drandich as Mark Ella, Shane McNamara as Alan Jones and Billy McPherson in several roles. Cole won the Griffin Theatre Award for the best new writing for theatre in 1999 and was shortlisted for the Victorian Premier's Literary Award in 2001.